Hitsville, USA, born from a dream with a will to make it happen. Berry Gordy started Hitsville, USA with $800 borrowed from his family, in 1959. From that time some of the largest acts in history recorded at Hitsville. Diana Ross and the Supremes, Stevie Wonder (who was signed at just 11 years old), The Jackson 5, Smokey Robinson and so many more. From 1959-1972 Hitsville, USA ran 24 hours a day, 7 days a week. Berry had said that magic happens at all hours of the day and he wanted the studio to remain open for when that magic strikes. There were 3 phones on the desk to take in the influx of calls, since there wasn't call waiting. 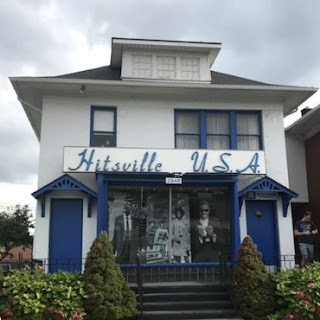 Hitsville is truly an iconic part of music history and the fact that it's right in Detroit, Michigan just makes it so much more special to me. It's also very special to others as well, other tourists in my group had traveled by car and plane just to visit this museum. It was a very diverse group and our tour guide was a blast. He helped us understand the history of Hitsville, USA and the Motown Museum. He also made jokes and had a lot of fun with the group. When Hitsville moved to California in 1972, Berry's older sister decided to make this a museum, and it's still actively running today as a museum. A dream that forever lives! You have a chance to sing in Studio A (the room where all the above recorded (and more) ). Even our tour was able to belt out "My Girl" led by our tour guide. Seeing all the original instruments and equipment was breathtaking. This piano was built in 1877. Sir Paul McCartney loved it so much when he visited the museum he paid to restore it fully in 2011. Speaking of Original, you can also tour through Berry's old apartment, complete with ORIGINAL furniture! In 1989 the record label sold for $61 million. $800 to $61 million in just under 30 years! Let that sink in! Cost: Ticket prices are $10-$15 with children under 4 being free. Parking: There is not a parking lot, but there is free street parking along West Grand Boulevard right in front of Hitsville. Photography: Photography is not permitted inside the building, in order to preserve artifacts. Reserve your time slot now: You can purchase your tickets online here up to 21 days in advance. Have you ever visited the Motown Museum in Detroit? That would be a fun place to visit. A bit far for me. 1400 miles.